Apart from the custom work, rebuilds and semi custom bikes that we build are the restoration projects that we take on. Over the years we have brought back to life everything from a 1948 Elgin, that had been stored in a barn for two decades and run over, to a Schwinn Stingray and A vintage Peugeot Team Race bike. Take a look below at some of the pictures and if you have a classic project yourself that needs bringing back to life, contact us or stop in for a chat. Don't let that trusty old steed of your youth rust any longer. A ladies 1953 Schwinn step through before restoration. 1953 Schwinn after the clean and restoration. Close up of the skip link chain and crank. This 1958 Huffy made by the raleigh bicycle company of Nottingham England. Another barn find, this time a trike. Frame after shot blast and repaint. Original decals applied. Ready to race once again. 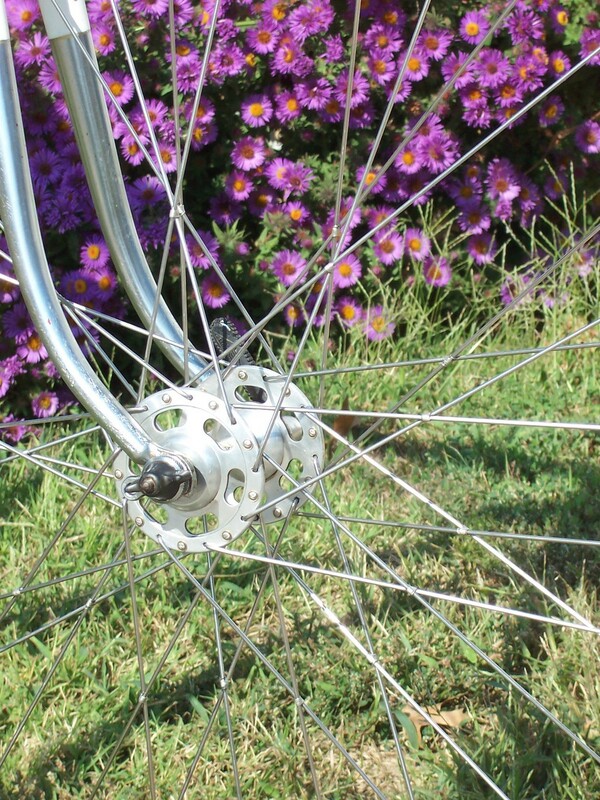 Close up of high flange hub and we even tied and soldered the spokes and put on tubular tires. Same Elgin after complete restoration and paint.